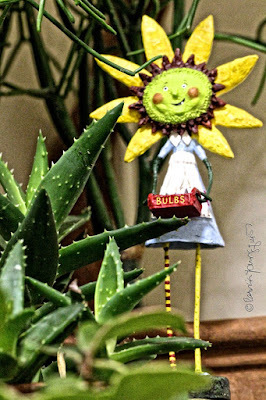 The figurine (picture above) who was intent on planting some bulbs (within my indoor succulent garden) and I were comparing notes re our experiences with flowers that are produced by them including; Muscari, crocuses and tulips. 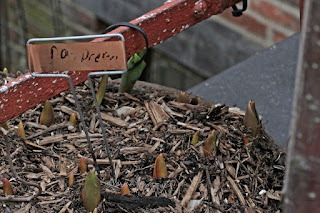 Over the years (more than ten) of maintaining my rooftop garden with the help of JV, bulbs for many varieties of the aforementioned flowers have been planted in my place. 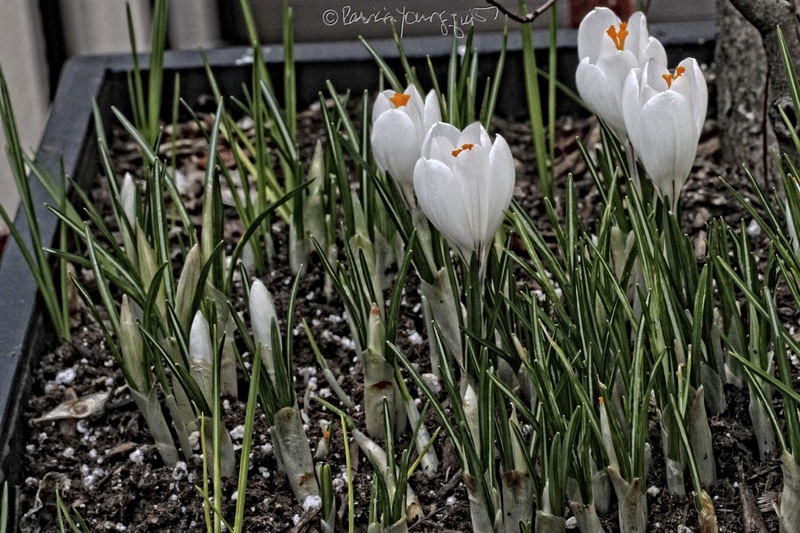 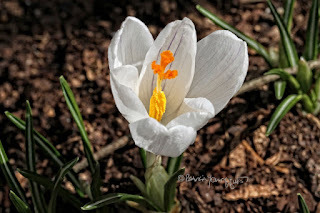 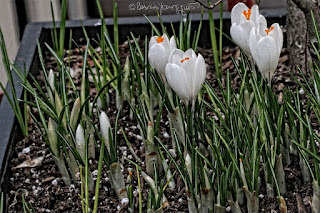 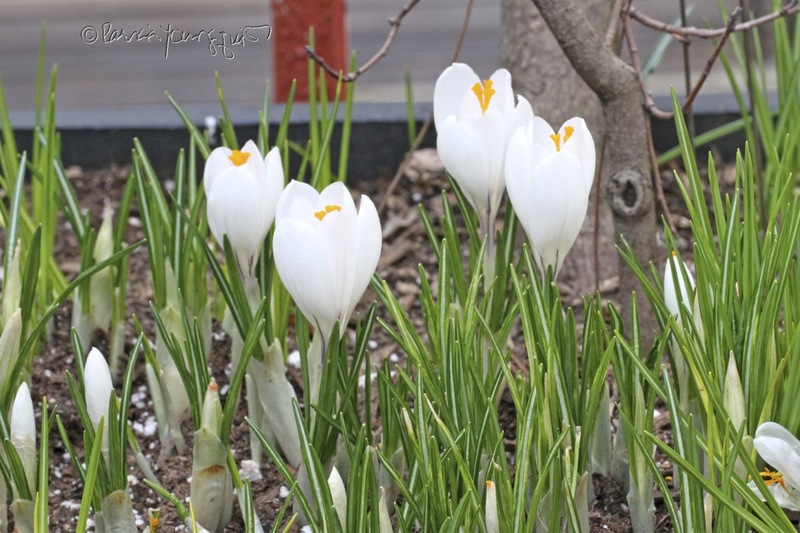 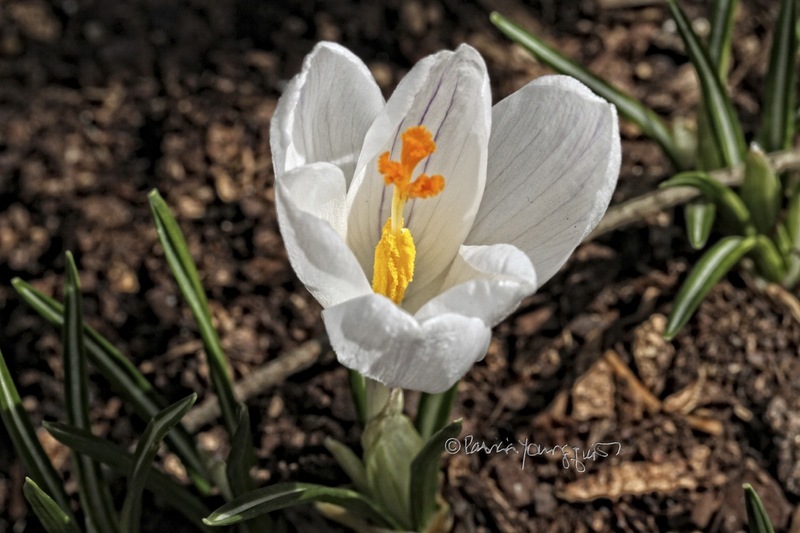 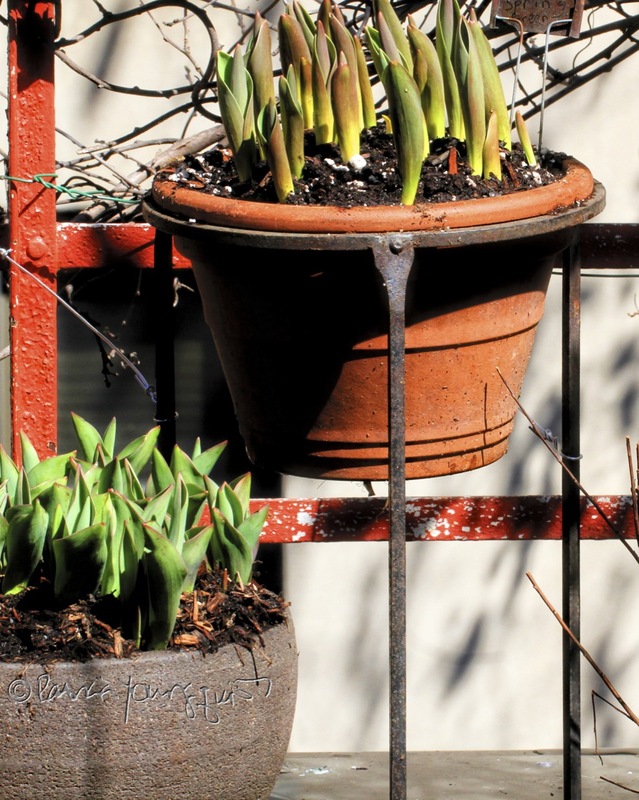 For this season, crocus and tulip bulbs were planted in early December of 2018 (we planted them within eighteen different containers), and a few examples of various tulip bulbs can be seen below. 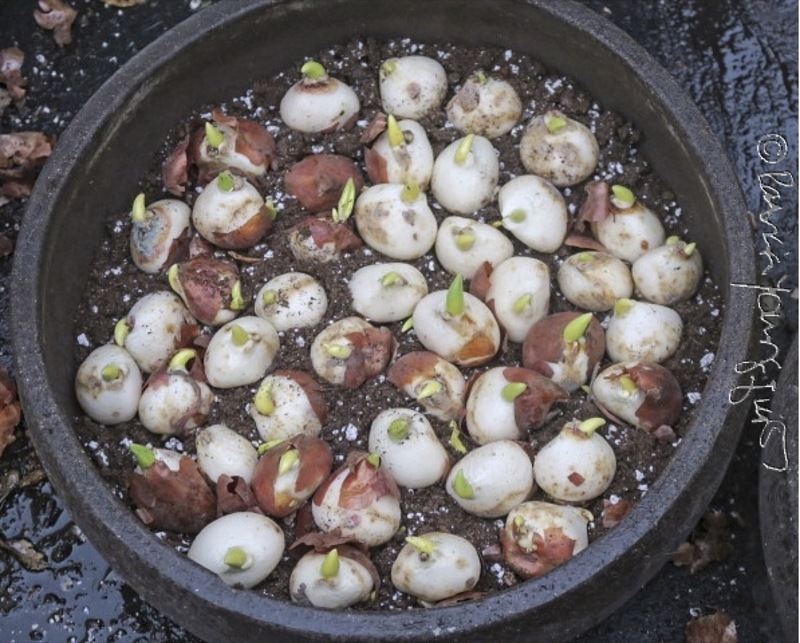 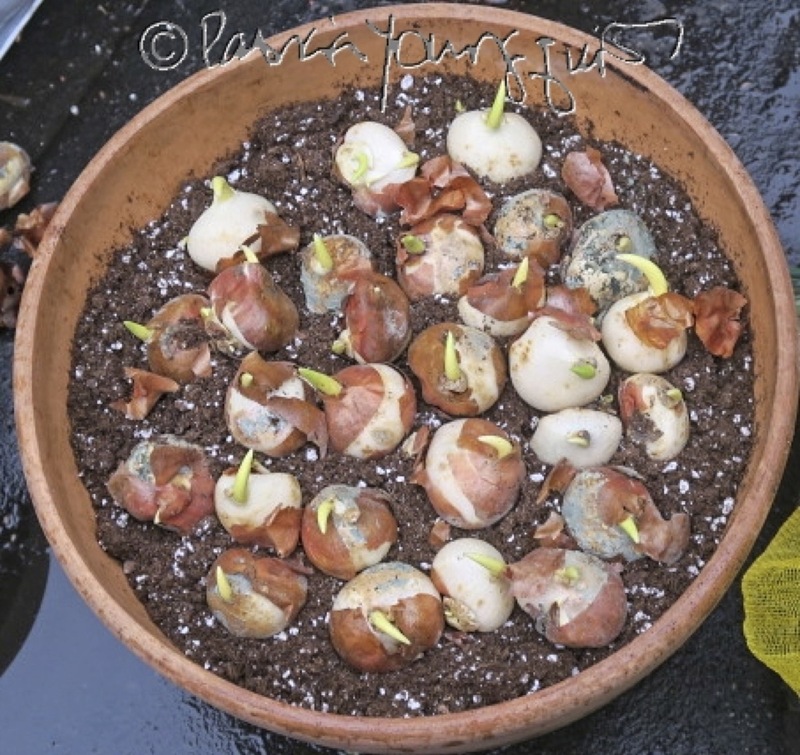 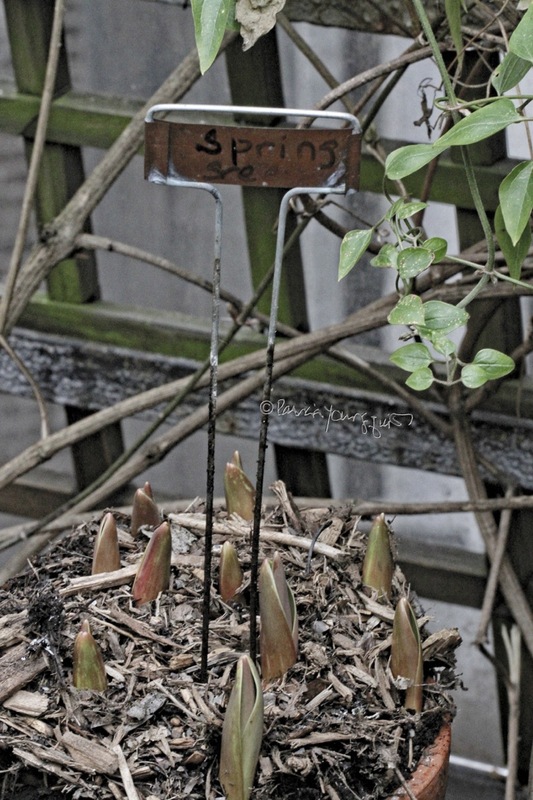 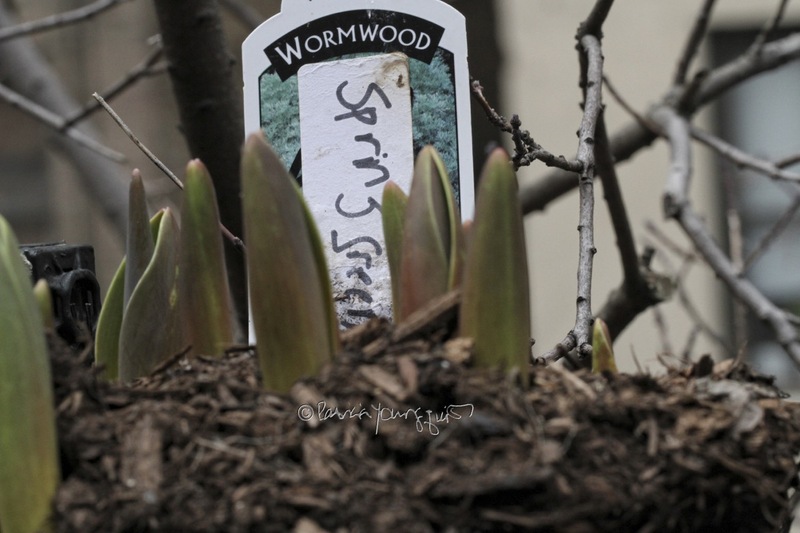 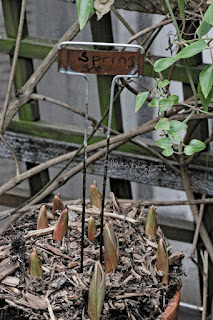 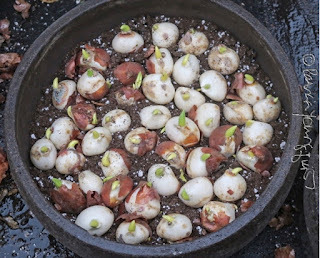 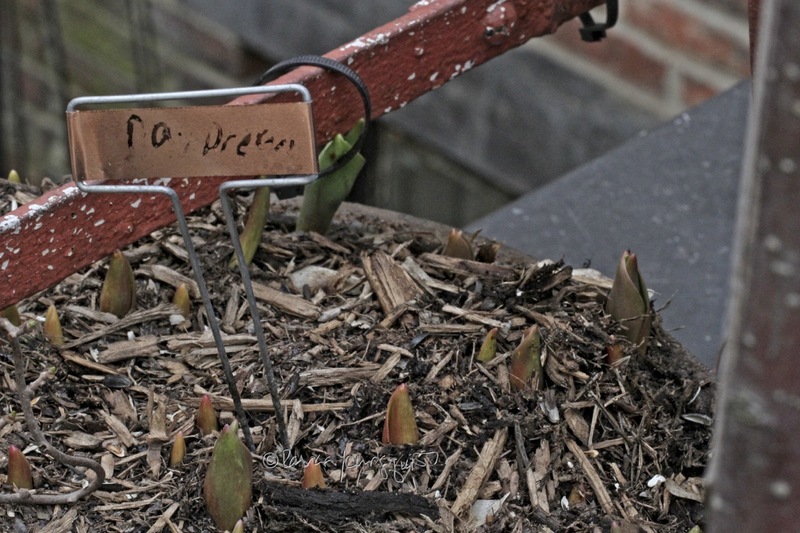 As you can see from a couple of these images, a few of the bulbs were already "sprouting," because we got a late start in planting them last year. 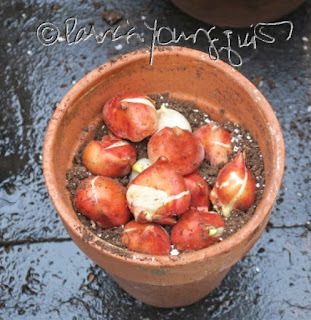 JV and I both appreciate all aspects of what is grown here, including the beauty we see in bulbs. 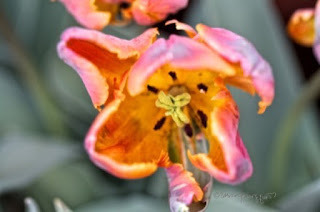 A number of people (including a former colleague) have told me that I am fortunate to see the beauty in "little things," which is a part of my nature and is something I have thought to be the case with every person; but I've learned that many people don't even notice the "little things." 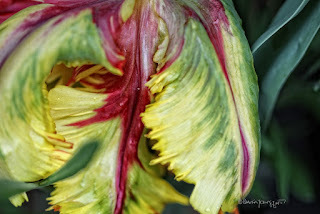 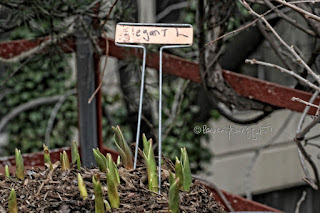 Be that as it may, last December after JV and I planted bulbs, we did our usual winterizing, a tedious process which is well worth the effort because my garden continues to flourish no matter how harsh a winter has been. 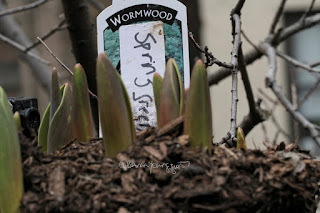 Our annual winterizing process has been discussed in prior entries here on Blogger. 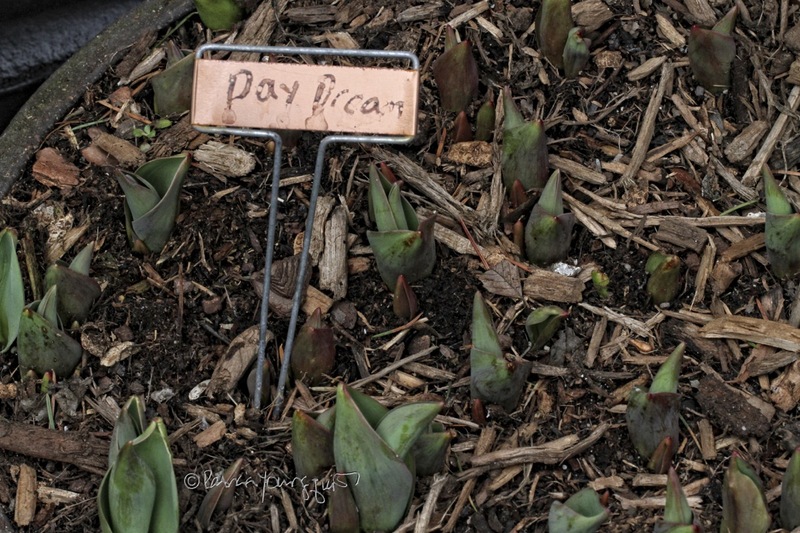 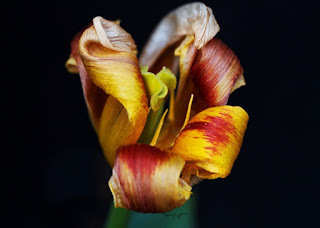 But getting back to tulips, shoots from the variety of bulbs planted in December are now beginning to wake-up at their own pace; as evidenced in the following set of images, which represent only a fraction of what is coming up in my garden. 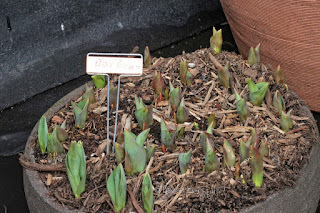 The early shoots of tulips are another supposed "little thing" that JV and I appreciate. 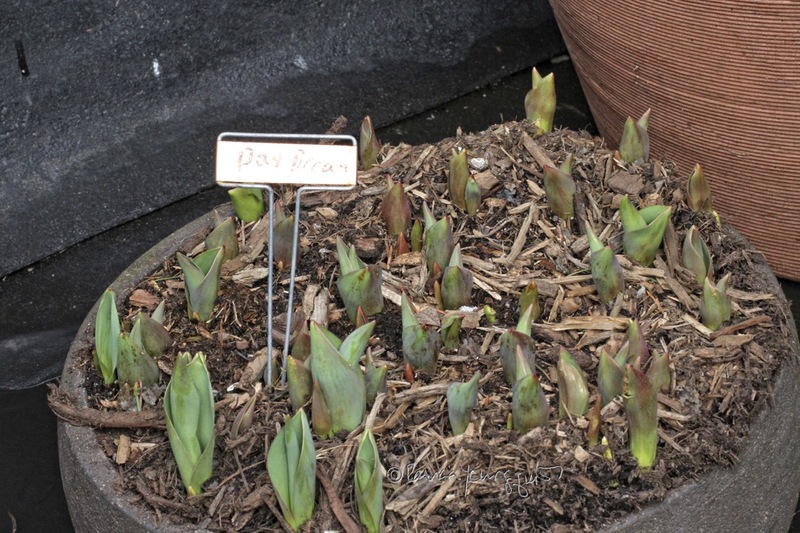 We hardly consider this occurrence little! 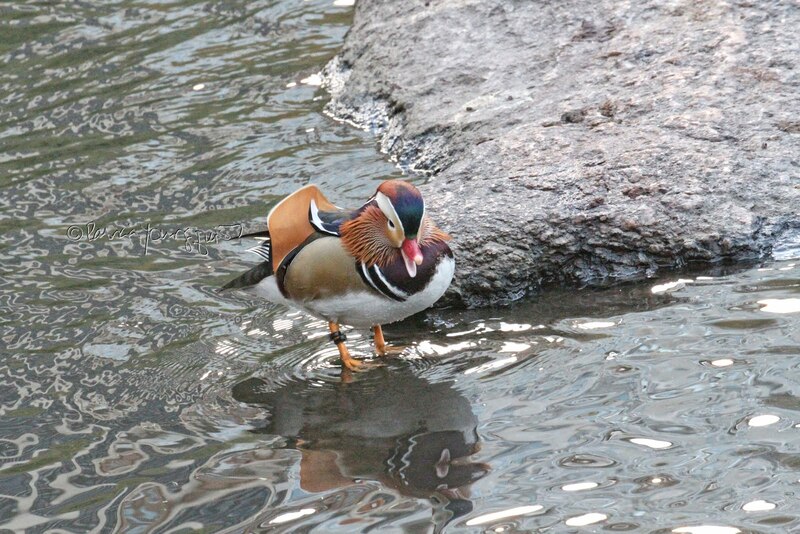 And he and I also appreciate tulips at their end of life phase. 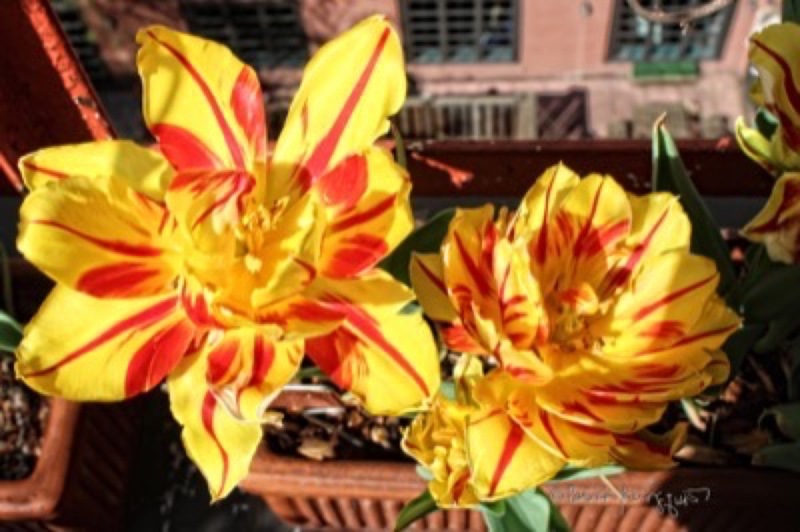 An example of a tulip variety in this state is featured in the photo directly below. 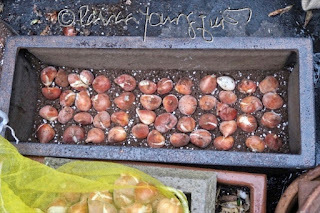 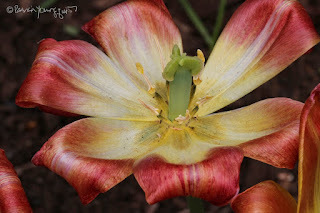 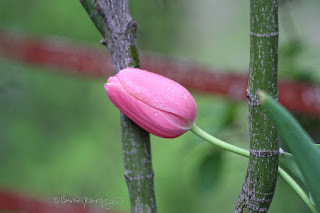 In any event, I am anticipating beautiful flowers from the bulbs planted in 2018, but am grateful to witness early these stages of their growth, as I have with so many tulip varieties that have bloomed here over the years. 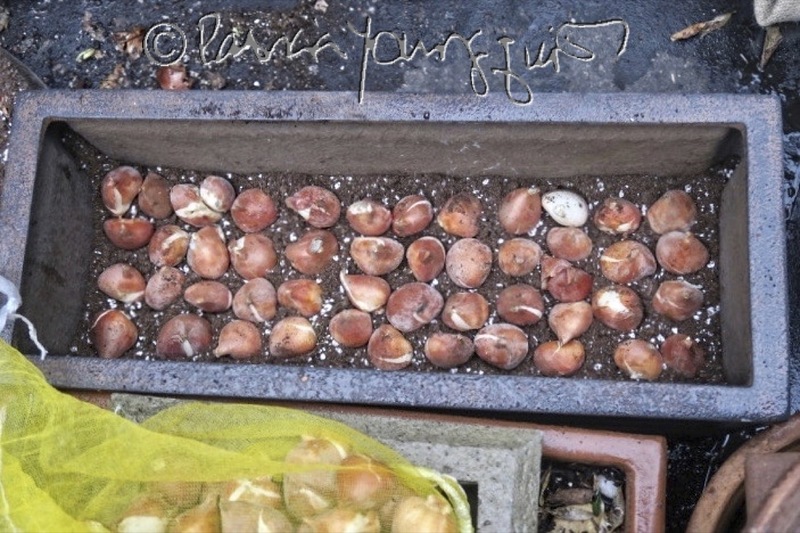 I plan to share photographs of the flowers that will be produced by the bulbs of what you see here (once they've fully bloomed). 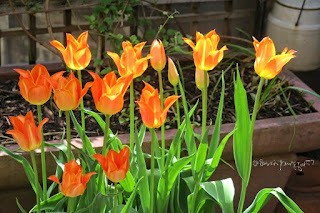 Meanwhile here are some pictures (which were taken from bygone years) of tulips in various stages of their individual bloom. 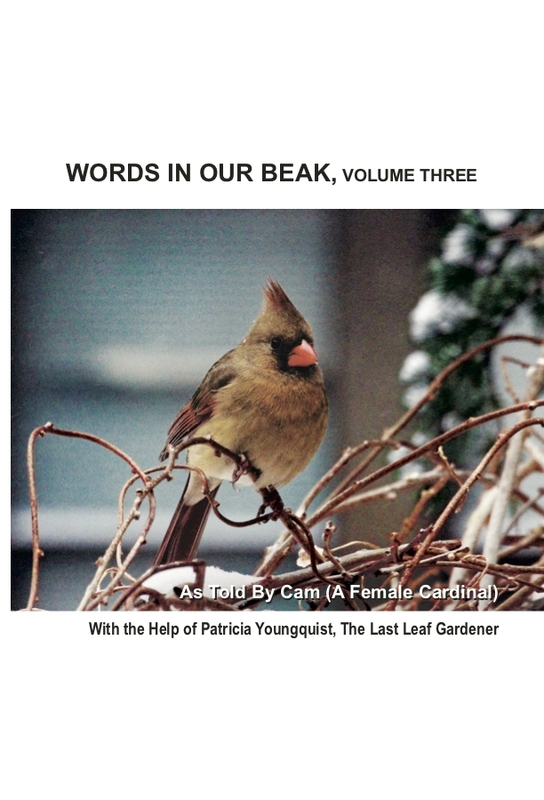 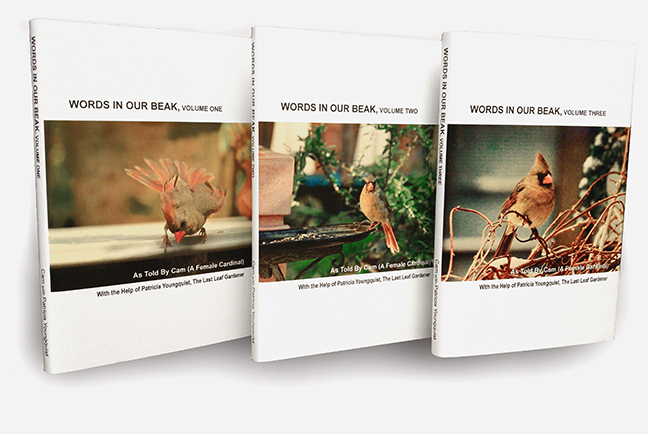 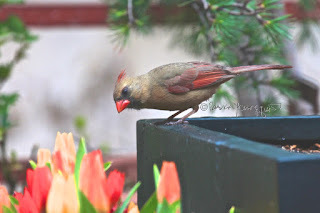 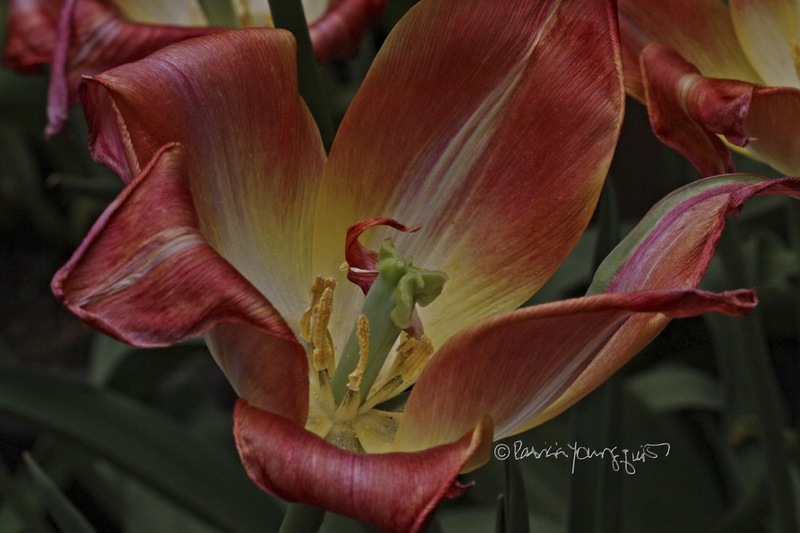 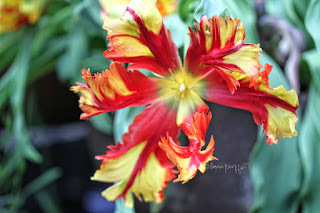 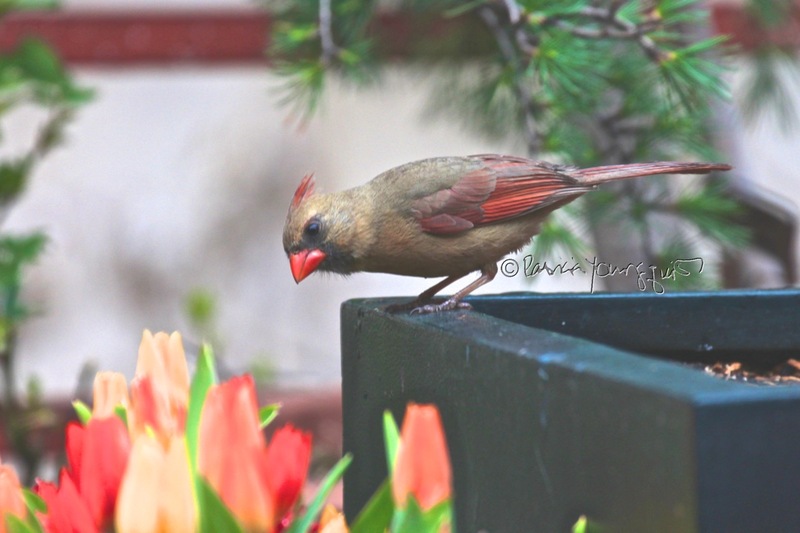 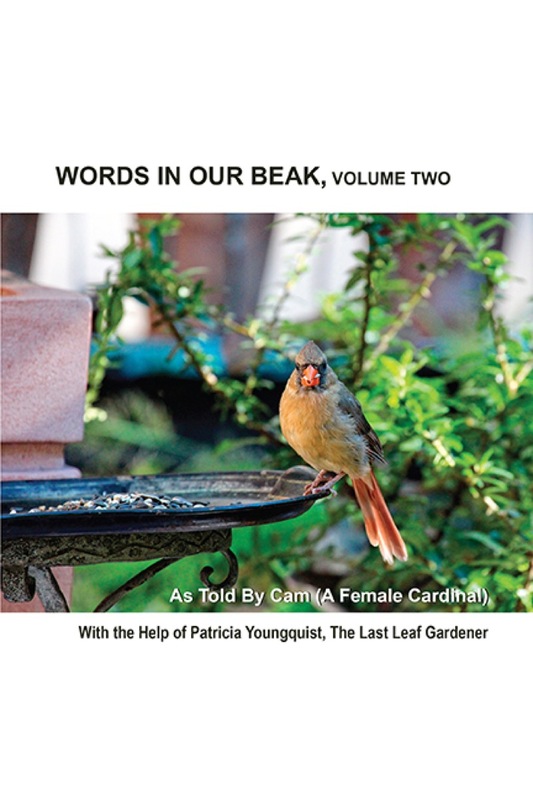 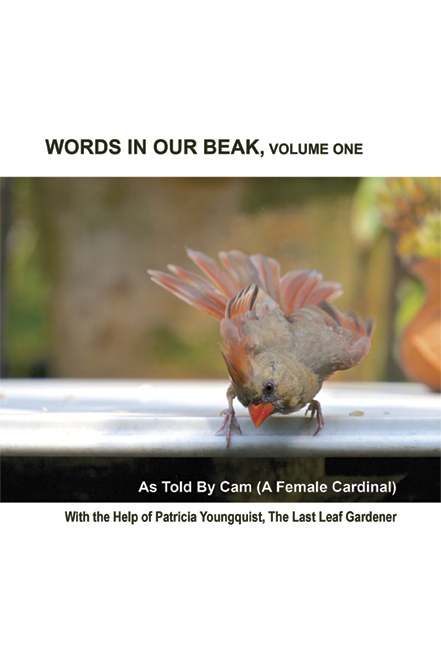 Many of the varieties seen directly above are included in volume one of Words In Our Beak, and Cam, the female cardinal (who is the storyteller in these books) offers a lot of information about each particular tulip type. Cam can be seen in the following photograph where she is admiring a variety of tulips known as Fire Sprays. 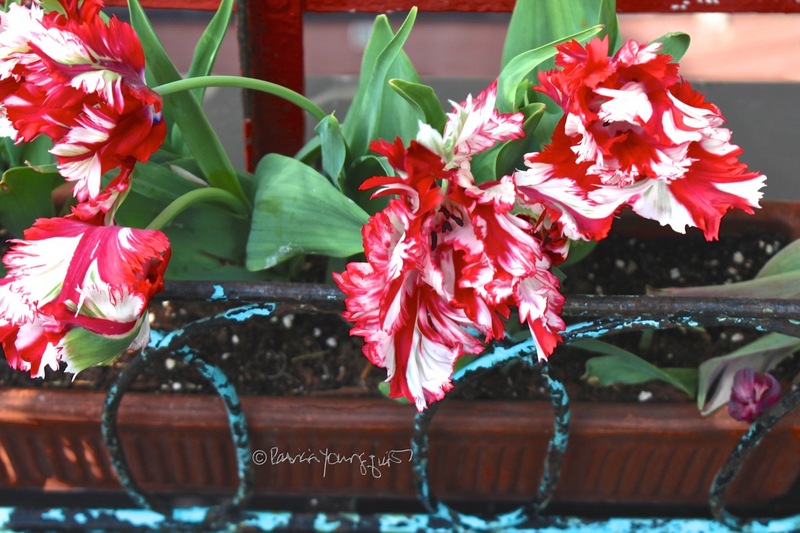 However, I do know that while Cam, JV and myself enjoy all aspects of tulips, not everyone appreciates them; which is the truism in this episode of my Tuesday's Truths series. 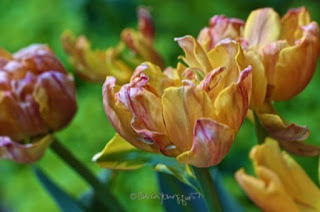 ..... and that my tulips were on their way. I invited her over to see them once they've bloomed, but M informed me that she did not like tulips, because, "they don't last long." M is hardly the first person I know to not like tulips but it's the first time I've been given that reason. 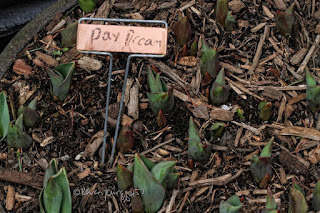 The poet, Sylvia Plath, also did not enjoy tulips, but her reasons were quote different than M's. 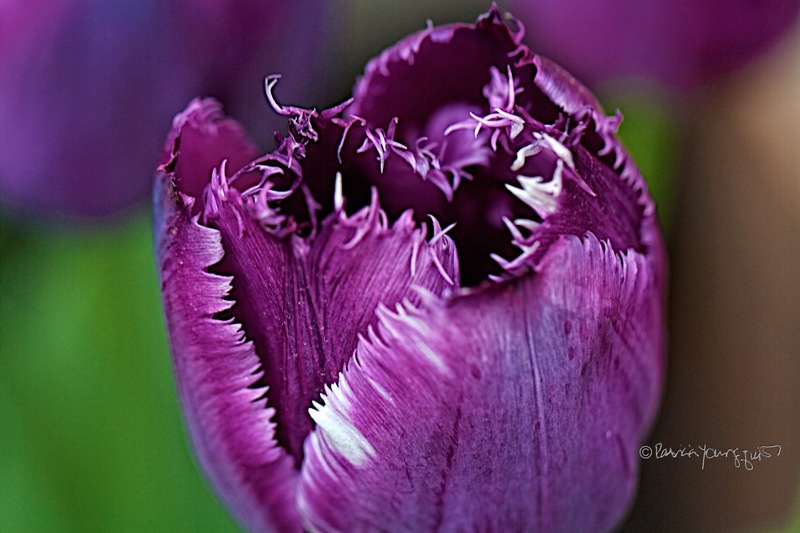 In her poem, Tulips, Plath likens the tulip's opening to "the mouth of an African cat" and was insulted that the "tulips ate her oxygen." I confess there was a time during childhood that I felt that type of despair which I discussed in a blog post. Having gone through that especially dark time should make me all the more thankful that I can enjoy the "little things" re tulips as well as many aspects of nature. 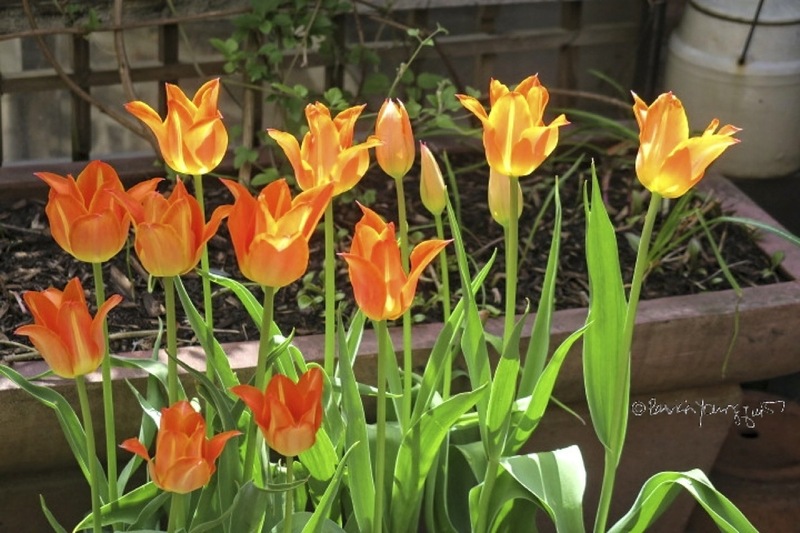 In any event, as I end this one-hundred and twentieth segment of Tuesday's Truths, I'll leave you with a copy of Plath's poem, Tulips.